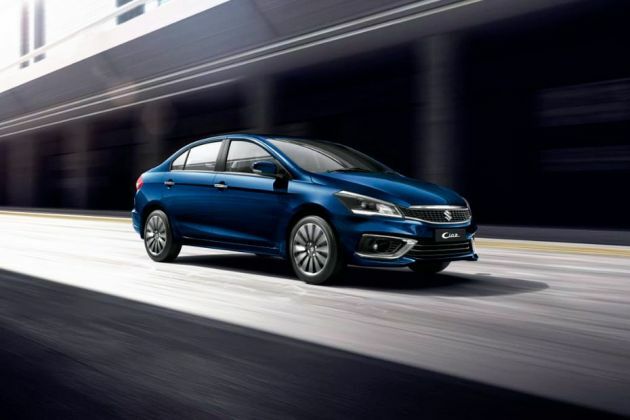 Maruti has made revisions to its Ciaz model series, and a new optional variant in the line-up has also been introduced, which is named as Maruti Ciaz VXi Option . It is powered by the same petrol engine that displaces 1373cc. Additionally, the company has gifted the drive-train with a new cylinder head and piston design for increased efficiency. It is guarded by reinforced braking and suspension mechanism, along with techno-aids such as the ABS. It also gets a list of features including dual front airbags, seatbelt pretensioner and force limiter as well as seat belt reminder with buzzer for driver side. This sedan otherwise retains its look. Its impressive design elements include stylish steel rims, refined body curvatures, well shaped projector lamps and a glass antenna. It has a wheelbase of 2650mm enables more space for the cabin within. The interior is graced with many plush features, such as chrome highlights and other fine garnishes. The limited cabin space is utilized cleverly, providing the occupants with good comfort and convenience. Some of these functions inside include height adjustable seatbelts, power windows, keyless entry and an electric trunk opening system. There are storage spaces in the doors, on the front panel, as well as cup holders, console box and handrests. This vehicle has a streamlined poise that renders it a sporty look. Going into specifics, its front facet is enhanced with the presence of a wide grille. It is garnished with chrome thus, making a more emphatic appearance. Other notable elements include a wide air intake, which helps in dissipating hot air from the engine. The stylish projector headlamps are also good assets to its appearance. There are sweeping lines on the hood, adding to its visual aesthetics. The balanced overall look endows it with a huskier rear portion that is wide and muscled. The tail lamps are good looking and they come with intricate lighting units such as courtesy lamps and turn indicators for safety as well. The sporty dual exhaust pipes also add to the visual treat, giving it the resemblance of a racing machine. As for the sides, there are steel rims with wheel covers. The wheel fenders have gentle curvatures that make a good design statement. In addition to this, the refined lines that stretch across the body side also impress its dynamic persona. In addition to all this, there is a blackout effect on B pillars. The outside mirrors and door handles are body colored, giving a more harmonious picture. Turn indicators are present on the outside mirrors, adding to the safety quotient. Its dimensions reflect a harmonious stance, with a height of 1485mm, overall length of 4490mm and a width of 1730mm. The cabin serves the purpose of comfort, as well as utility. The seats are covered with a fine quality upholstery. Handrests are present in both the rows, allowing easier hand placement. There are headrests as well, which ensure comfort as well as safety. It has a three spoke steering wheel with a chrome garnish that further adds to its look. Besides this, the chrome effect on door handles, AC Louver knob and parking brake lever tip makes it more appealing. Moreover, the front center AC Louvers with satin finish gives a magisterial feel. The I/P is graced with wooden finish that adds to its rich environment. Coming to the utility side, there is an illuminated console box for storage purposes. In addition to this, storage spaces are present in the front panel, and on door trims as well. The information display behind the steering wheel adds sophistication to the space, and it includes a trip meter and a fuel consumption reading. It is equipped with the same K14B, 1.4-litre petrol based engine. It comes with a VVT system, which optimizes intake valve timing for better performance. This mill is based on double overhead camshaft configuration with a displacement value of 1373cc. In addition to this, it combines a power of 91.2bhp at 6000rpm with a torque of 130Nm at 4000rpm. This drive train is paired with a 5 speed manual transmission for improved working and easier shifting. Being integrated with a multi point fuel injection system, it can return a maximum fuel economy of 20.73 Kmpl approximately. Its braking and suspension systems remain unchanged. Ventilated discs secure the front wheels, and drums are present on the rear. The front axle is rigged with a McPherson strut mechanism meanwhile, the rear is formatted with a torsion beam, which renders a smooth and stable drive. And, there is a responsive steering column with tilt adjustment feature. This ensures easy handling on any road condition. Standard requirements for cars of the day include a good music system, and this sedan fulfills this requirement with an audio unit, which comes together with a CD player facility as well. A USB port is present, allowing occupants the convenience of integrating devices with this system. There are four speakers and two tweeters within the cabin, giving a well distributed sound quality. There is a power socket at the front and rear, providing charging utility for the passengers. It has power windows with auto up and down as well as anti pinch functions on the driver's side. The manual air conditioning system is further aided with the presence a pollen filter and vents at the rear. Besides all of this, it is also provided with a utility box, electrically adjustable ORVMs, illumination control and tilt steering facility among many others. This trim comes loaded with an anti lock braking system that enforces safety by improving control when braking. It also has airbags for front passengers, protecting them in case it meets with some kind of a mishap. Seatbelts are present for added security, and their working is further enhanced with pre-tensioners and force limiters. There is driver's side seatbelt reminder as well with buzzer. The defogger helps to keep the rear windscreen clean and visible. Also present is a manual day/night interior mirror, which gives a wholesome view of its surroundings. In addition to all of this, a security alarm together with an engine immobilizer affirms the safety of the vehicle. 1. Fuel economy is quite decent. 2. It has appealing exteriors. 1. Limited range of comfort features. 2. Engine performance could be improved.